Next stop, the ancient city of Babylon ( modern day Iraq). Artist reconstruction of ancient Babylon. 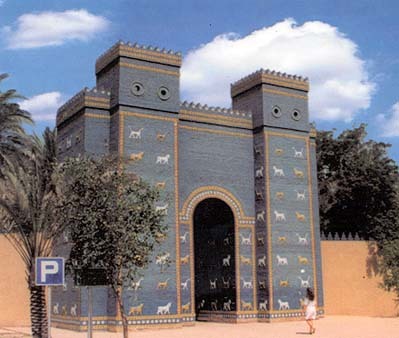 Reconstruction of the Ishtar Gate that stood in Babylon during the time of Nebuchadnezzar II. "The approach to the Garden sloped like a hillside and the several parts of the structure rose from one another tier on tier... On all this, the earth had been piled... and was thickly planted with trees of every kind that, by their great size and other charm, gave pleasure to the beholder... The water machines [raised] the water in great abundance from the river, although no one outside could see it." The name of the Gardens is actually incorrect. The name comes from a mistranslation of the Greek word kremastos or the Latin word pensilis, which does not mean "hanging", but "overhanging", as in the case of a terrace or balcony. This means the gardens were literally spilling over the walls. Of all the Ancient Wonders, the Gardens of Babylon remain the most mysterious. In fact, it's the only Wonder that's very existence has been called into question There are records and contemporary images of each of the other six wonders and even archaeological remains, but none have been found for the Gardens. Most historians believe that members of Alexander the Great's army brought the stories of the gardens back to Greece. Were they accurate descriptions of a real place or the tall tales of returning soldiers? The gardens were said to be located on the east bank of the River Euphrates, about 50 km south of Baghdad, Iraq. King Nebuchadnezzar II (604-562 BC) is credited for building the legendary Hanging Gardens. The story says that Nebuchadnezzar built these elaborate gardens to please his wife Amytis who had been "brought up in Media (a mountainous region) and had a passion for mountain surroundings". While the most descriptive accounts of the Gardens come from Greek historians, such as Berossus, Diodorus Siculus, Strabo and Philo of Byzantium, there are no Babylonian records. However, it is somewhat hard to believe that the Greek historians would include the Gardens among the other wonders without having great confidence in their existence. Archaeologists are still working to find evidence of the Gardens. 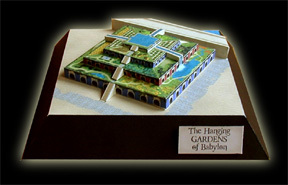 Some researchers have recently suggested that the Hanging Gardens were built by Senaherib, not by Nebuchadnezzar II, one hundred years earlier. 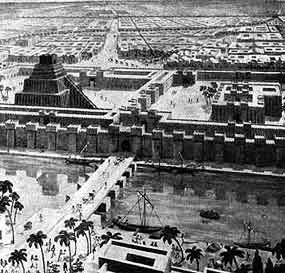 Because of the political climate of present day Iraq, it has not been feasible to mount extensive excavations of Babylon. It is possible that as life changes in Iraq more can be done to explore it's remains. "The Garden is quadrangular, and each side is four plethra long. It consists of arched vaults which are located on checkered cube-like foundations… The ascent of the uppermost terrace-roofs is made by a stairway..."
Diodorus tells us it was about 400 feet wide by 400 feet long and more than 80 feet high. One has to imagine that such large and lavish gardens built in such a unique manner and in the middle of the desert would have been an awe inspiring sight. This model is slightly above basic skill level .